On the East side of town, about a 5 minute motorcycle ride from downtown. This beach runs about 2 kilometers from Serendipity Beach to Otres Beach. Ocheteaul is filled with beach stands and chairs. Seafood, burgers, pizza, and booze. Most places serve Khmer style food, but many now offer Western dishes. Across the street from the beach, there's an assortment of restaurants and hotels. The tourist beach on the East Side. No beach stands here, just Western style bars and restaurants. One of the few places with rooms right on the beach. Many new internet shops, clothing, MP3 downloads, tour services and boat departures to the islands. Serendipity has turned into the shopping section of town. At the bottom of "The Hill", near the port, Victory beach has quickly become the tourist beach on the West side of town. An easy walk from Victory Hill, with plenty of seafood, boating activities, guesthouses, and a full service casino. Some quiet beach in the middle, and some restaurants towards the port. Also, featuring a pier for island boat trips. Independence Beach gets its name from the deserted hulk of the 7 -storey Independence Hotel at the north end. Locals call this beach 'otel bram-pil chann (hotel 7-stories). It is labeled '7-Chann Beach' on the in-town street sign. Independence is more than a kilometer long, but the sandy area is much narrower making the beach best when the tide is low. The beach is wider and more tourists toward the northwest end near a small fresh water lake (which is the source of the town's fresh water and is rumored to contain crocodiles). At the other end is the beach's only hotel, Sea Breeze. Grass umbrellas and drink vendors only hotel, Sea Breeze. Grass umbrellas and drink vendors now line the beach from end to end but it is still much less frequented than other beaches. The road up to the old Independence Hotel is often frequented by a small troop of Rhesus monkeys but is currently closed while the hotel is undergoing renovation. Sokha beach is a private beach 1.5 kilometers for the guest of the Sokha Resort hotel. Well groomed beaches, not too many people, and for a fee (if you're not a hotel guest), a beautiful swimming pool, fitness center, and lobby lounge. At the near end of Sokha are a few hillside and Cliffside bungalows. Hawaii beach is filled with pine trees, shading the beach area. Many small boats are available for rent to the islands. Outside of town, Otres is the quietest beach in town. Several small beach stands with food and umbrellas are available. Also, sailboat and kayak rentals. Though not untouristed, the Ream Beaches see far fewer visitors than Preah Sihanouk beaches. Located in the Ream National Park. Take Route 4 to the Airport road 18km north of town. Turn right, go 9km to the ocean. The beach to the right is long and narrow and frequented more by fishermen than tourists. Behind the beach is a mangrove swamp, which attracts a wide variety of tropical birds. The beaches to the left nearer the Naval Base now have a few vendors selling drinks and renting tubes. There is a small $5 per night guesthouse run by the National Park. Check at the park HQ opposite the entrance to the airport. Weather Station Hill is known by many names - Port Hill, The Hill and most popular amongst the alternative names, Victory Hill, after the Victory Monument and Victory Beach at the base. The Hill is the original budget traveler center of Preah Sihanouk offering several ocean view budget bungalows and guesthouses and even a couple of upscale places on the hill within a couple of hundred meters of the beach. Nowadays the top of the Hill has become one of the centers of nightlife in Preah Sihanouk offering a real variety of venues including a few restaurants, several guesthouse bars, sports bars, laid back music bars and even a few hostess bars, many staying open stay late into the night. Locates at Khan Prey Nup in seven-Kilometer distance from the Preah Sihanouk Town, then turning left more nine-Kilometers by a red soil road. The waterfall of Kbal Chhay has many sources from the mountain rank at the seaside. The history of Kbal Chhay waterfall was found in 1960. Until 1963 Kbal Chhay arranged as the clean-water sources for providing to Preah Sihanouk, but the arrangement was failed became a hidden place for Khmer Rouge. In 1997, Kbal Chhay was changed to the developing zone. 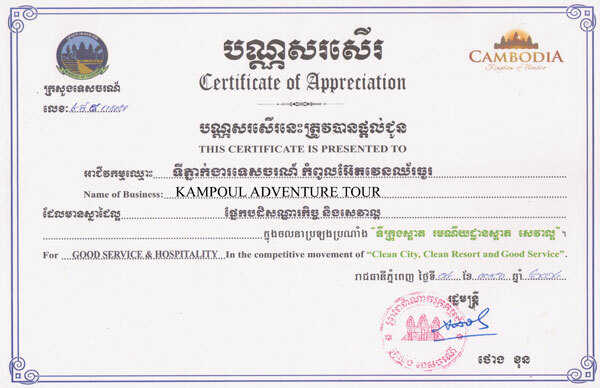 In 1998 Kbal Chhay was for bid by Kok An Company on constructing road and changing this site as tourist resort for local and international tourists. Nowadays, the Royal Government of Cambodia has changed this site as the clean-water sources so as to provide clean water to Preah Sihanouk Town.